CTLgrads Learning Communities are interdisciplinary and sequential conversations about teaching and learning topics, designed and co-facilitated by CTL Senior Lead Teaching Fellows. Teachers’ Lounges are series of informal discussions about teaching practices and the culture of learning at Columbia. Visit the CTL Events Calendar to browse upcoming events for graduate students. CTLgrads Learning Communities are interdisciplinary conversations for graduate students on teaching and learning topics, designed and co-facilitated by CTL Senior Lead Teaching Fellows. 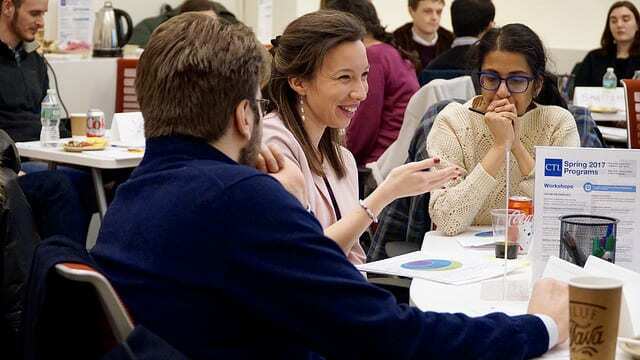 By participating in these multi-session discussions of the teaching literature with other graduate student instructors, participants develop new frameworks to innovate their teaching. Teachers’ Lounges are series of informal discussions about teaching practices and the culture of learning at Columbia. Our conversations often introduce graduate students to related educational models, research, and theory, and invite dialogue about their pertinence to day to day teaching. The CTL also offers Language Lounges that provide an opportunity for graduate students to focus on how they apply our knowledge of second language acquisition to their instructional practice and share ideas with peers teaching in other languages.